It's Labor Day Weekend & that means one event & one event only that will encompass any & all of my free time... LA Times and Food & Wine Magazine's THE TASTE! 8 fantastic events. 3 awesome locations. 4 days of FUN. Event I'm most looking forward to? Food Noir. Delicious 213 bar cocktails, Vintage food and Cartoons on screen at the Orpheum? Sounds like heaven to me! The Los Angeles Times and Food & Wine are combining forces to create the ultimate food and wine event for Southern California. THE TASTE will feature the nation’s foremost culinary talent, a carefully curated list of L.A.’s best restaurants, and notable personalities, all converging for a festival expected to attract more than 20,000 guests throughout the course of Labor Day weekend, September 2-5, 2011. The four-day schedule will ensure an exciting and inspiring lineup of star-studded events from day until late into the evening. “Burgers & Beer” and “Secrets from the Kitchen & Cellar” will be held in Beverly Hills and kick off the weekend’s signature events. Celebrity guests and top music artists will also be on hand along with appearances by Giada De Laurentiis, Scott Conant, Art Smith, Ludo Lefebvre, Michael Voltaggio, Claire Robinson, Debi Mazar and Gabriele Corcos. Tickets are still available at http://events.latimes.com/taste/ & use discount code: WEB for 40% off your order! 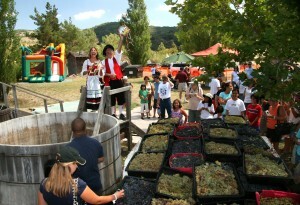 White Trash Wine Tasting @ Colorado Wine Co.
Read all about it at FinerThingsLA!